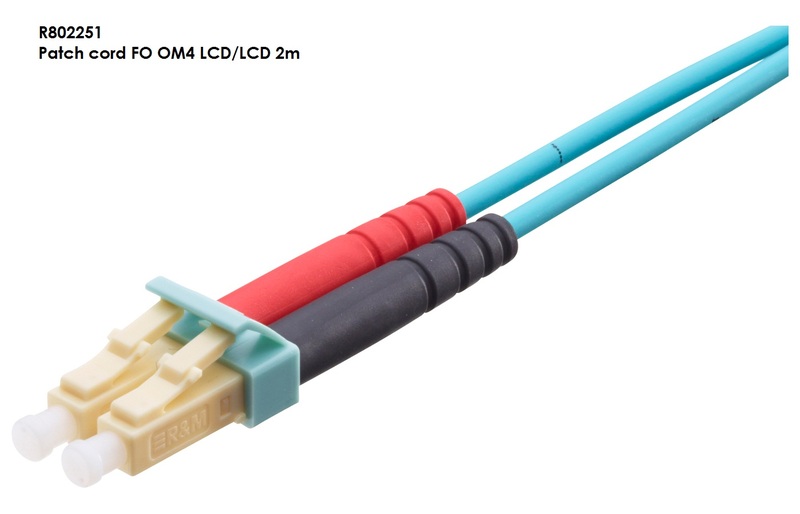 Patch cord with LSZH jacket, F8 2.0x4.1 mm, turquoise (aqua), multimode G50 50/125 µm (OM4), bend-optimized, length 5.0 m.
Mounted on both sides with LC-Duplex connectors in acc. with IEC 61754-20. Zirconia (ceramic) ferrule with a PC polished endface geometry, connectors qualified in acc. with IEC 61753-1 for category U (uncontrolled environment). Beige connector housing (multimode), turquoise duplex clip, material PC / UL 94 V-0, 1 x black and 1 x red strain relief, white plastic dust cover.